If you are charged by Police with a criminal offence, the police may at first instance release you on bail in your own undertaking, that is a promise that you will attend Court on the return date. If Police oppose bail, you must be taken to Court on the next working day where you can elect to make a bail application. If you make a bail application you will either be required to demonstrate to the bail decision maker that ‘exceptional circumstances’ or ‘compelling reasons’ exist and that your remand is not justified. What are your options if bail is refused? Support structures such as acceptance into a rehabilitation clinic. You may also appeal the bail decision maker’s decision to refuse bail in the County or Supreme Courts of Victoria. What are your obligations while on bail? If you are released from custody on bail, you must abide by all of the conditions of your bail. If you don’t, you may be charged with a bail offence, such as contravening a condition of bail under section 30A of the Bail Act 1977 and your bail may be revoked. If you are found guilty of contravening a condition of your bail, you may be sentenced to up to 3 months in gaol or receive a fine of up to $4,751.10. It also a criminal offence to commit an indictable offence whilst on bail under section 30B of the Bail Act 1977 and your bail may be revoked. If you are found guilty of committing an indictable offence whilst on bail, you may be sentenced to up to 3 months in gaol or receive a fine of up to $4,751.10. 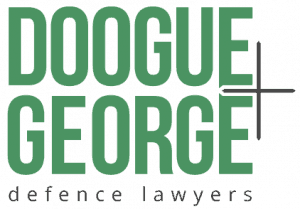 Doogue + George are experienced bail lawyers. If you have been charged with a bail offence, we may be able to contact the informant and organise for you to be re-bailed. We will explore all your options. Call 03 9670 5111 or fill out the form to the right of this page to meet with one of our lawyers.